The discovery of salt is an important revolutionary moment in human civilization, while the use of salt significantly influenced the sustainability of the food for a longer period and the possibility of its transportation over long distances. Grocery salt dates from the time of ancient China (2000 BC), where there were wars and conquests to gain salt fields. The Romans were very fond of sea salt, which is the fact that Roman soldiers received a clod of salt instead of payment. In the middle Ages, on the territory of the Sahara, the value of salt had measured with the value of gold. What makes the sea salt so special? Today, the chemical structure is determined by two ingredients - sodium and chlorine, two elements essential to all living beings. For the proper functioning of the human organism, it is necessary sufficient quantity of salt. It is assumed that the daily amount of salt for an adult man is 5 grams, while during the summer heat, heavy physical work, this amount may increase, due to the loss of electrolytes through sweating. What is the role of salt in the body? Sodium and chlorine, which together have created salt, have the duty to maintain the balance of the liquid level in the whole organism. Lack of salt leads to functional and organic disorders that manifest themselves in the form of spasms of sceletal muscles, and sometimes can lead to damage of the central nervous system. Which types of salt now exist? Nowadays, there are three types of salt - natural, refined and iodized salt. Each of the kind has its own specific taste, and the taste influenced by the presence of minerals. The natural salts include stone and sea salt. Rock salt is obtained from the salt mines, which are located in a place where the salt lakes were once, while sea salt allocates from seawater and it producing in the salt factories. Sea salt is the best and healthiest, because in addition to the usual mineral content, sea salt contains iodine, which is essential for normal functioning of the thyroid gland, as well as bromine, which aids in concentration and mental work. The most expensive type of salt called fleur de sel, which is hand-picked, and for that reason is tastiest of all other kinds of salt. 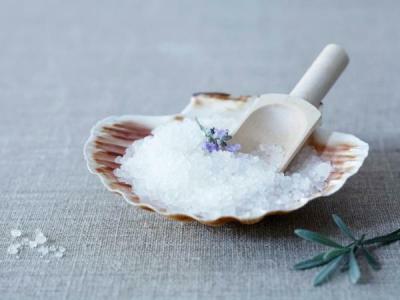 Sea salt has always been used as a cure for cellulite, and as natural elixir for healthy and beautiful skin. Unlike refined salt, which draws water from the cells and makes skin dry, limp and old, pure sea salt is not dry out, but on the contrary, it nourishes and nurtures skin. Sea salt is also important in maintaining skin health, because in addition to the usual trace elements, it contains amino acids and vitamins in trace amounts. In the fight against cellulite, sea salt has proven to be effective, because it stimulates the secretion of water from subcutaneous tissue, speeds up metabolism and exchange cellular ingredients. Salty sea water helps with irritation of the mucous membrane of the nose or allergic rhinitis or colds. It should also be used aerosol (particles of salt dissolved in water) in order to eliminate nasal congestion, mucosal edema and the presence of mucus in the nose. It is believed that sea salt has healing properties in people with varicose veins, which can soak feet in water with added sea salt. Rinse with salt water is a sight for women who have ovarian inflammation or vaginal secret.